20 years and 1 day ago, followers of the Formula 1 motor racing series, and much of the population of Brazil, were shaken to the core with the death of iconic driver Ayrton Senna, who suffered a high-speed crash at the San Marino Grand Prix in Imola (Italy) in 1994, the last driver to die at the wheel of such a car during a race. 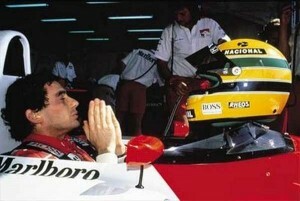 On a tragic weekend in which lesser-known Austrian driver Roland Ratzenberger also suffered a fatal crash, occurring in a qualifying session the day previously (and Senna’s fellow Brazillian Rubens Barrichello narrowly escaping with his life the day before that (going on to be the longest-serving driver in the series’ history)), the death of Senna, leading the race for the Williams F1 team at the time of the tragedy, was pivotal in kickstarting safety initiatives for the sport, as well as inadvertently increasing the lasting legacy of the man in the yellow helmet. With the death of the 3-time champion (aged 34 at the time) having occurred on 1 May 1994, many motorsport personalities and fans extended their marking and tributes to the 20th anniversary of the crash yesterday, including the video game Gran Turismo 6, which has offered a selection of content including an online-exclusive documentary. In addition to a range of ‘inspired’ in-game content released throughout the month in honour of Senna under the ‘Ayrton Senna Tribute’ name, the Sony racing title yesterday unveiled a documentary short focusing primarily on Senna’s impact away from Formula 1. Available to watch below or on the game’s website (amongst other ‘Ayrton Senna Tribute’ items accessible), Ayrton’s Wish displays Gran Turismo’s relationship with the charity Ayrton Senna Institute (IAS), set up by his family posthumously to continue the work with Brazil’s youth that Senna had been involved in when he was alive.